This cheesy, creamy quiche is absolutely delicious and sure to be a winner with the whole family. Made with chicken, it’s a perfect addition to your dinner menu. I love quiches. And when I had my first bite of this one about a year ago, I knew it was a keeper. It’s so, so good! Cheesy and creamy, with just a hint of tanginess thanks to the nutmeg and sour cream, it’s a real winner with the whole family! 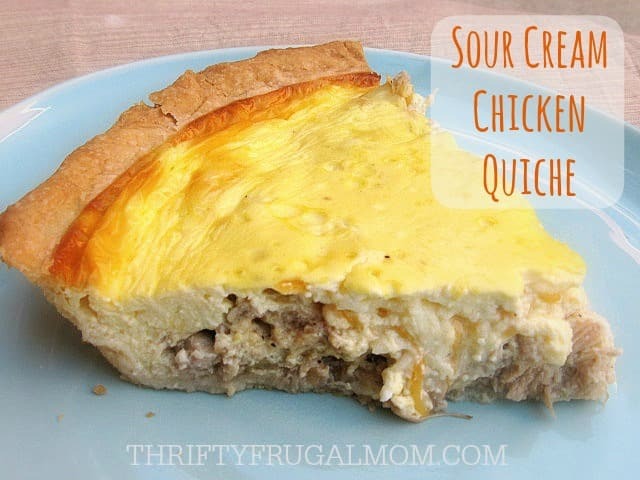 For a real treat, instead of using a pre-made bought crust, make this quiche with my Easy Homemade Pie Crust. In medium frying pan, heat oil on medium-high; add onion and green pepper. Saute until soft, stirring frequently. Remove from heat. Stir in chicken, salt, nutmeg and pepper. Spread over bottom of unbaked pie shell and top with shredded cheese. Combine eggs, milk and sour cream; mix until smooth. Pour over chicken mixture. Bake for 20 minutes. Reduce temperature to 350º and bake 20 to 30 minutes until inserted knife comes out clean. * If using 9 in. crust, reduce egg to 2 or just put whatever filling doesn’t fit into our pie crust into a separate small dish and bake that way. Recipe adapted from Mommy I’m Hungry. MMM! I love quiche...and enjoy eating it with fruit too. This looks awesome. Thanks so much for sharing with us at Weekend Potluck. Have a great weekend. I have never had a quiche quite like this!! I will have to try it! It's definitely a unique twist on traditional quiche- but a very delicious one! Oh, this would be perfect for a birthday lunch, Bob! I want to come. :) I'm not a big asparagus fan, but I would think that it would pair nicely with this- it actually sounds kind of tasty to me! Although I hate to tell you to try something like that when you are going to be serving it to guests. If it was me, I'd try to make one for dinner sometimes before the lunch and add asparagus to part of it just to make sure you like the combination. If you try it, I'd love to know what you think and how the asparagus worked for you.